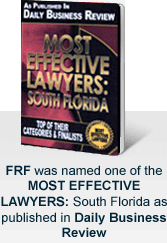 At the law firm of Friedman, Rodman & Frank, P.A., our reach is certainly not limited to Miami and the surrounding area. With offices throughout South Florida, we are able to provide the same great service to people in the Fort Lauderdale area, the Naples/Fort Myers area and the West Palm Beach area. If you or a loved one has been injured due to an act of negligence, you can be confident that you can find our experienced attorneys right where you need us. We are where you need us, when you need us. Because we understand accidents don't just happen during business hours, we have lawyers available to assist you 24/7. When you contact us, you can meet with an attorney who can communicate with you in English, Spanish or Creole. We urge you to contact us by calling 305-448-8585 or toll free at 877-448-8585 or contacting us online. All consultations are always free and confidential.